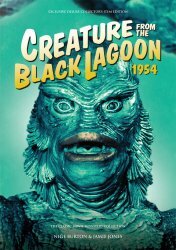 Direct to MyMovieMonsters.com from the creators of Classic Monsters of the Movies magazine in the United Kingdom: The Creature from the Black Lagoon 1954 Ultimate Guide evokes the brochure you might have bought at the cinema in 1954! It is a luxury magazine dedicated to the Universal classic. Universal's 1954 classic Creature from the Black Lagoon has a special place in the hearts of countless fans of classic monsters. The combination of adventure, drama and horror is hard to top, with sterling performances from Richard Carlson, Julie Adams and Whit Bissell. The Gill-man himself, meanwhile, makes for an unforgettable aquatic antihero, portrayed to outstanding effect by Ben Chapman (on land) and Ricou Browning (in the water). Each of the many articles in this guide's 36 pages is accompanied by beautifully reproduced stills, posters and lobby cards, taking you back to the Amazon in style. Cast and crew biographies give depth and insight to the people who made Creature from the Black Lagoon such a key reference point in the history of horror movies. This is the perfect item for any fan of the Creature. The Rita is about to head into new water -- make sure you're aboard! Want this Ultimate Guide as well as the Frankenstein Guide? Use the handy Buy Both button below! 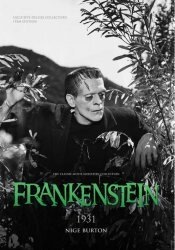 Classic Monsters Frankenstein (1931) Ultimate Guide - Karloff Klassic!